In Fall of 1992, I believe, or maybe Spring 93, I took an Intermediate Poetry class with an instructor and poet named Tom Andrews. He was bald, soft-spoken. I don’t know if he encouraged me, after a number of missed classes and my explanation, to use my illness as muse; but then, I already had, in my fiction class and in my first poetry class. 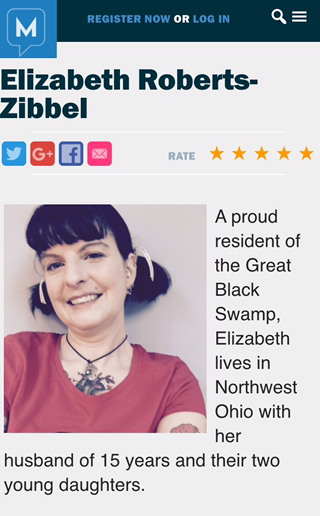 I felt the drive even then to make people understand: these “headaches” that had paralyzed me, left me shaking and bedridden and vomiting my entire life, when some people just took Tylenol for theirs. I was already using pain as art. My first migraine poem was called “Sumatriptan” after the magical new drug whispered and passed between doctors and neurologists in hospital hallways like code. I was able to get my hands on this drug early, in tablet form, before it was accepted by the FDA, by driving the short distance to Canada. It was 1992. My first dose, a cylindrical wafer on the tongue, truly was a miracle, leaving me gasping in shock with tears streaming down my cheeks as every doom-spelling symptom vanished, the blind spots, the nausea, the weakness, the stabs of pain already emerging. Tom Andrews liked me. He must have. He graded my portfolio glowingly, writing, “You will have to sign your first book for me.” His own book of poetry, his second, came out in 1994, called “The Hemophiliac’s Motorcycle.” He was one. Who raced dirt bikes. A section of the book was called “The Codeine Diaries.” They were illness poems. He too had turned his pain into art. Tom Andrews ended up giving me a B+ that quarter, which devastated me. When I went to ask him why, he intimated I may have done a bit too much flirting with my Nietzche-reading, hair-flipping writer friend in class and not enough active workshopping of others’ poems. Participation, bah. Would always get me. I was very sad to hear that Tom passed away due to complications from his hemophilia in 2001. Around that time, J and I were getting married, having had our first art show collaboration a year before at the coffee shop / bookstore gallery where we’d met. 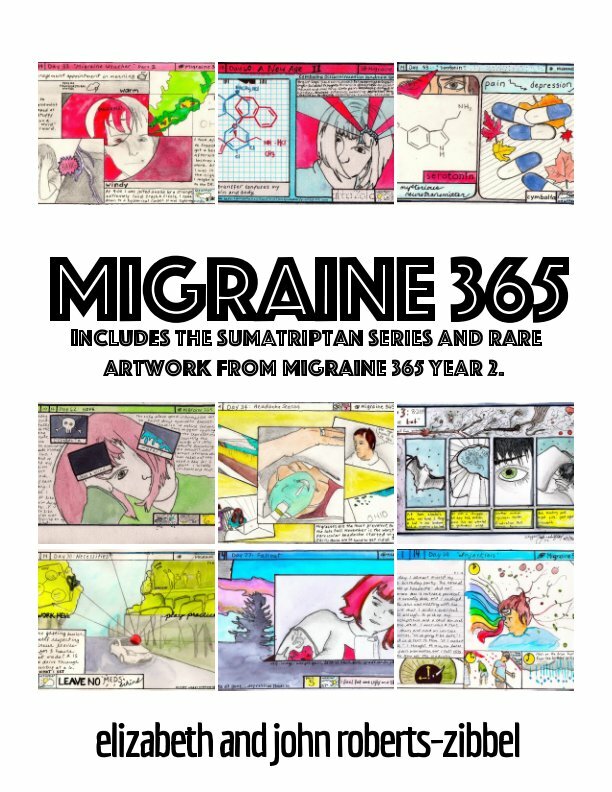 “The Sumatriptan Series.” The first page of the series was published tonight on Migraine365. When J pulled it out last week, seeing it again took my breath away. Tom Andrews’ collected works, published by Oberlin College Press, is called Random Symmetries. I, myself, love random symmetries, and see them as signs from the universe that I’m on the right path. Another one I thought about as I worked with filtering and sharpening the Sumatriptan piece online was that I did have access to that landmark medicine earlier than most American migraineurs, having had a forward-thinking doctor, willing parents at $20 per pill, and the right geography. And now, just over 20 years later, having barely outlived Tom Andrews (he was only 40 when he died on a trip to England), I once again have access to a landmark migraine medication before most sufferers. The CGRP medications are creating more and more excitement, making more news, as success rates mount with few side effects, and it’s a preventative. I am so lucky to be participating in my study at MHNI, which just entered the open label phase. I have had one subcutaneous injection of the real thing, and 3 previous possibilities during the double blind phase. You know what I did today? I sat for 3 hours at the museum sorting dusty, 100 year old sheet music in a dimly lit room. Then I went to pick up prescriptions and bought a Reese’s Peanut Butter Egg, and I ate it in the car on the way home, while “Happy” was playing on my stereo, and the sun was shining as I crested the overpass and drove back into my small, fog-brightened city. It was freaking delicious. Oh, I know that feeling all to well.